Do you want to know what the best gifts for us, ukulele players, are? If you want to find out you’re on the right page as I will use it to present three of the best gifts any ukulele player would love. We have to point out the fact that nowadays there are many gifts we can choose from but some don’t give us anything else besides gathering dust. 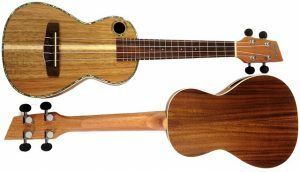 However, if you love the Hawaiian music instrument ukulele you can buy a truly great gift that you can actually use. No matter our experience playing ukulele an hour with a good music teacher can never hurt. 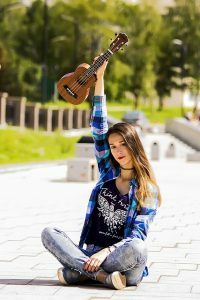 We all know that knowledge is really important in the world we live in today so by buying a ukulele lesson we can sure gain something positive from it. We can gain new experience and become better ukulele players which will make us enjoy the instrument even more. We can find really good ukulele lessons on this page. …Yes, this is not a bad gift choice. Just think about how Hawaiian you’d feel with a nice Hawaiian theme shirt. You could also buy a specially painted ukulele which is designed in a true Hawaiian style. Today you can buy almost anything that makes you feel like you’re spending your time in Hawaii, sipping a cocktail and playing ukulele. You can build your own Aloha tiki bar in your backyard which can become a nice and relaxing place and you don’t have to spend thousands of dollars on it. All you need is some creativity and this Tiki Bar Building Guide. You can use it to find all of the knowledge you need to relax in your backyard. And that is it! Those are the three best gifts for ukulele players… what do you think? Which gift seems to be the best? So you’ve bought a ukulele but don’t know how to play it yet. Don’t worry. Learning how to play the ukulele shouldn’t be a drag. You also don’t need to spend some cash to learn how to play it. When teaching yourself how to play the instrument, there are only three things you need to have: ukulele, your fingers, and a burning passion for music. 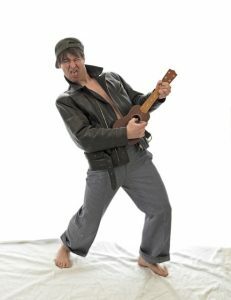 Ukulele, otherwise known as uke, has been gaining popularity lately. And it’s no wonder why. Uke is a cute instrument that makes sweet music. It is basically like the guitar’s baby sibling. It is also handy, making it easy for you to take it anywhere. Just like the guitar, it also easy to play. One could actually make a million songs with just one chord. This basically means listening to your favorite songs. For beginners, it is recommended to opt for songs with simple chords. Strum along with the song. Don’t worry about making mistakes. It’s part of the learning process. Keys make the chords. That’s why it’s important to find the right keys. It would be better to choose the song’s karaoke version. Doing so will allow you to focus on the keys used. Conversely, humming or singing the song can also help you determine the prominent keys. Once you’ve established the chords, you’re now all set to master the song’s melody. Play around the melody. Do not be afraid to explore the song. Expand the chords if you must. Go beyond the given keys. They say that writing down things is a very good reminder. That’s why it’s important to write the prominent keys of a song. That way you can familiarize yourself with the chords. Once you are familiar with the chords, you can be more confident to use the keys and make another song out of them. For some, getting used to the keys can be a bit of a challenge. That’s when patience becomes essential. Do not be discouraged when you make a mistake or two. Use those mistakes as lessons. Remember that you are both a teacher and a student here. You don’t want to give your teacher and your student a hard time. Let them be patient with each other. Be patient with your beginner self. Practice, practice, practice. Hone your skills as if you are preparing for your first concert. It is basic human instinct to repeat things until you get them right. Just like any other craft, music takes a lot of practice. Tip no. 5 is a main ingredient when practicing your chords. These are just a handful of tips that could help you get started as you fiddle with your uke. With these tips, you will develop a good feel and ear for playing the uke. Have fun!